MAASDIJK – Next week, VTM will reopen in their renovated office in Maasdijk. DAEL Data & Electro has taken care of both the electrical installation as well as the lighting and data installation inside the building. One of the key principles of the renovation was the realization of a timeless office space and service centre focused on both ICT and telecom solutions. The completely renovated and restyled ground floor of the building replaces their old Telecom showroom. This appearance reflects the expansion of products and services VTM offers to their clients. The new open office space offers enough room for the 40 professionals currently working for VTM Group. 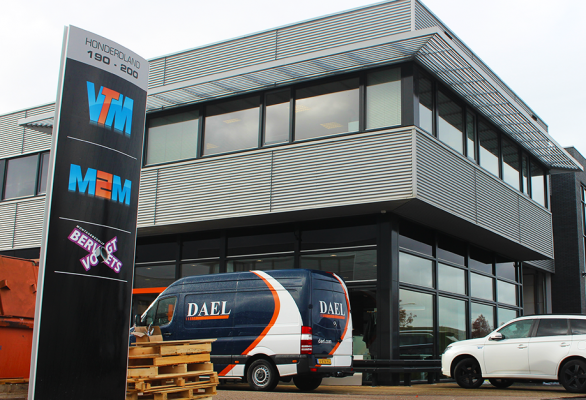 VTM Group commissioned DAEL Data & Electro to renew the entire electrical installation as well as the lighting and data installation on the ground floor of the building. Our engineers spent about six weeks on the realization of the various electrical installations. The project was delivered today, within the estimated time. Other parties involved were UP Projectinrichting, Dijkxhoorn Bouw and technical installation company Schwagermann. With the completion of the work today, the interior of the building has a completely fresh and modern look. Any questions or comments in response to this message? Please feel free to contact redactie@dael.com for more information.